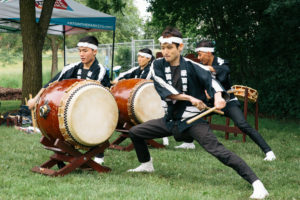 Last weekend I took a short trip to Flemingdon Park to watch the Toronto Taiko drumming group, Nagata Shachu, perform with traditional Korean performing arts ensemble Jeng Yi at Arts in the Parks. I was excited for what I would see, especially because it would be the first time I would witness live Taiko drumming. What I saw however, was more than just an entertaining concert. Located in Toronto’s North York District, Flemingdon Park is a wide expanse of green space encircled by a series of high-rise apartment buildings. Different groups of people were enjoying the park –some at the basketball court; others testing out hover boards on the soft grass. I joined the crowd gathered under a group of trees lining the sidewalk and waited eagerly for the performance to begin. 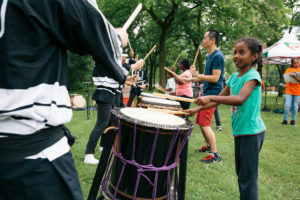 The air around the captivated audience at Flemingdon Park vibrated with the intensity of the Taiko as Nagata Shachu, a vibrant extension of their instrument’s emphatic rhythms, brought the park to life. After the performance I asked Kiyoshi, founder of the Nagata Shachu drumming group, what it felt like to drum consistently for 10-15 minutes. He proved my suspicions –it was definitely physically draining. Shouting, he told me, was a way to encourage each other to play. 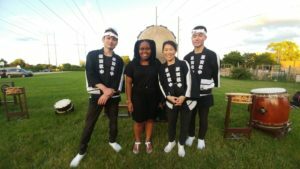 After talking to Kiyoshi, it dawned on me that Taiko, as we know it today, is as much an act of community and relationship as it is an art form. It’s impactful, entertaining and emotional to be sure -but it’s also collaborative, inspiring and motivating. It’s an art expression where rhythms are matched through tension, time and space. It really is all the things we aim for in our communities and in our diverse city of Toronto. I couldn’t help but think about these connections as I watched Nagata Shachu perform. It appeared to me that the drums were talking to each other and that the performers matched their body language to the emotions and the rhythms they conjured up. Kiyoshi and I shared the same sentiments, and I found out while talking to him after the show, that these were the same thoughts he had when he first heard Taiko as a child. Digging a little deeper I found that the history of the Taiko drum is steeped in community traditions from ancient Japan. Like many drums in the ancient world, the Taiko was a form of communication. It helped signal important times of the day, warn of danger or function as part of a spiritual ritual. In fact, the Taiko was so important that it was thought to be inhabited by gods. Given that I knew nothing about the Taiko tradition before going to Toronto Taiko Tales, I was pleased to be able to learn and see so much. I saw Nagata Shachu preform beautiful yet powerful pieces. I saw the crowd light-up with amusement and surprise as the performers brought the power of an ancient drum with a modern twist to their front steps. I also learned that at the heart of the Taiko tradition are all the things we value in our city: creativity, diversity and community.